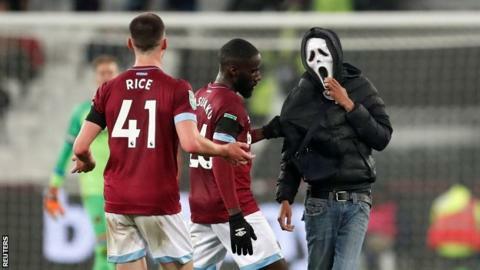 West Ham will speak to London Stadium's operators as they try to find out how two fans got on the pitch during the 3-1 Carabao Cup defeat by Tottenham. The club are waiting to hear if they will be sanctioned by the Football Association for a pitch invasion and crowd trouble against Burnley in March. The club gave lifetime bans to five supporters who invaded the pitch during the match against Burnley. Wednesday's incidents are the latest in what has been a difficult tenancy at the old Olympic Stadium, for which West Ham pay £3m a year in rent. The London Legacy Development Corporation (LLDC) is responsible for the overall management of London Stadium, which is set to lose £140m over the next 10 years, but the matchday operation falls to subsidiary company LS185. In addition to the ongoing investigation into the game against Burnley, there have been several disputes about who pays for certain elements within the stadium. West Ham are due to face LLDC in court later this month over the ground's capacity, which has been set at a figure less than the 60,000 the club argue they were promised. Last month, West Ham vice-chairman Karren Brady told the London Assembly the club would consider any offer to run the stadium in its entirety, though there has been no suggestion that is likely to happen. She also said the club would like to take more charge over the running of the stadium on matchdays.